Banana bread is something I don't recall eating when I was a kid at all. I am not sure if my mom made it or not. Knowing my picky self, I probably refused to eat it because I was super twitty like that. As an adult, I have grown to love banana bread. I still make my favorite recipe whenever there are overripe bananas in the house. But, now that I have tried this recipe out, I think this may have to take the number one spot. I absolutely love the crunch of the seeds in the bread. I know a lot of people put nuts in their banana bread, but that is totally not my thing. I love nuts alone or in a salad, but not in baked goods. I feel their flavor is too overpowering. Seeds are an excellent alternative to nuts. You get the crunch, but not the flavor punch. 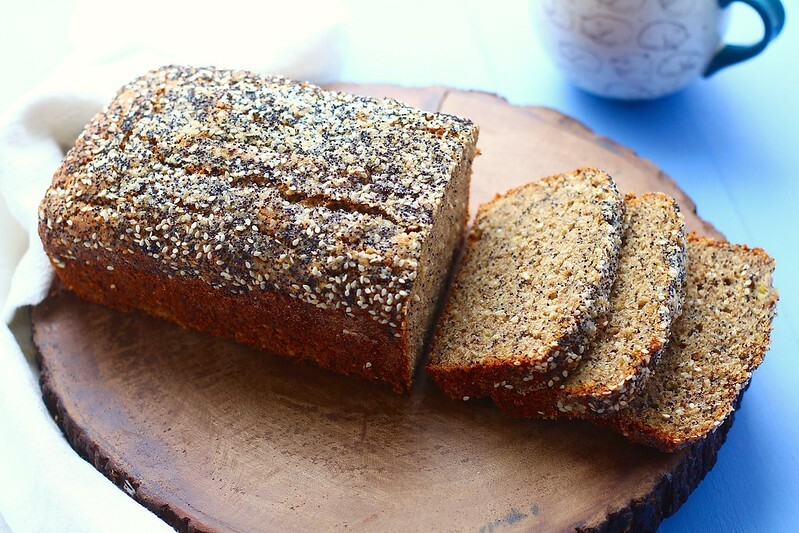 This bread is made with whole wheat flour and minimal sugar. So we can consider it healthy, right? My favorite way to eat this bread is with a cup of coffee after I've done my morning chores and routines. Any excuse to sit down for a few minutes to break up the never ending laundry pile, dishes and occasional morning workouts. This bread also freezes wonderfully. 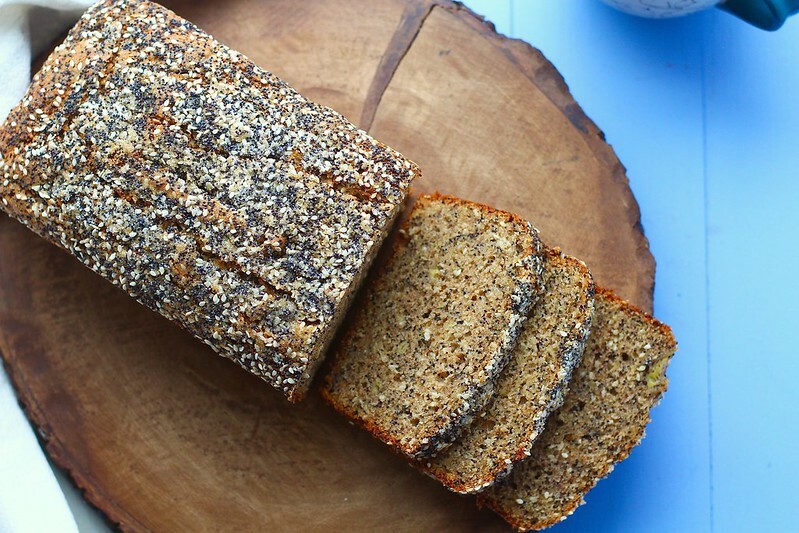 So, make a double batch and freeze the other loaf, sit, sip your coffee or tea and enjoy a few slices of this banana bread warm with a slather of butter. Preheat the oven to 350ºF. Grease and flour a 8 1/2 x 4 1/2 inch loaf pan. Set aside. 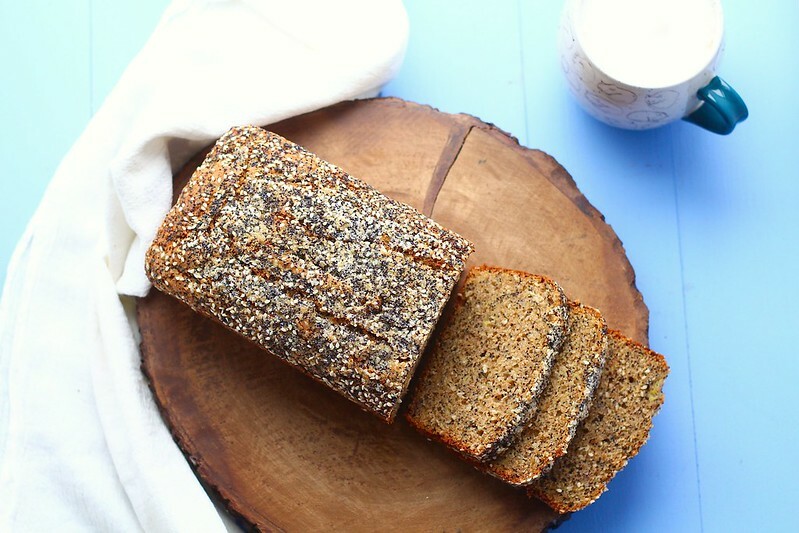 In a small bowl, mix together the 2 teaspoons of the poppy seeds, 2 teaspoons sesame seeds and 1 tablespoon sugar. Set aside. In a medium mixing bowl, whisk together the flour, remaining 1/4 cup poppy seeds, 1/4 cup sesame seeds, baking powder, and salt. In a large bowl, whisk together the oil, bananas, eggs, remaining 2/3 cup sugar and vanilla extract. Stir in the dry ingredients until no dry streaks remain. Scrape the batter into the prepared loaf pan and smooth the top. Sprinkle the seed/sugar mixture evenly over the top. Place in the preheated oven and bake for 50-60 minutes, or until a knife inserted in the center comes out with just a few clinging crumbs. Remove from the oven and let cool in the pan for 15 minutes, then turn the loaf out on to a cooling rack. Refrigerate any leftovers up to 5 days. Wrap and freeze up to several months.